Julie Nutting Designs: Emboss It! 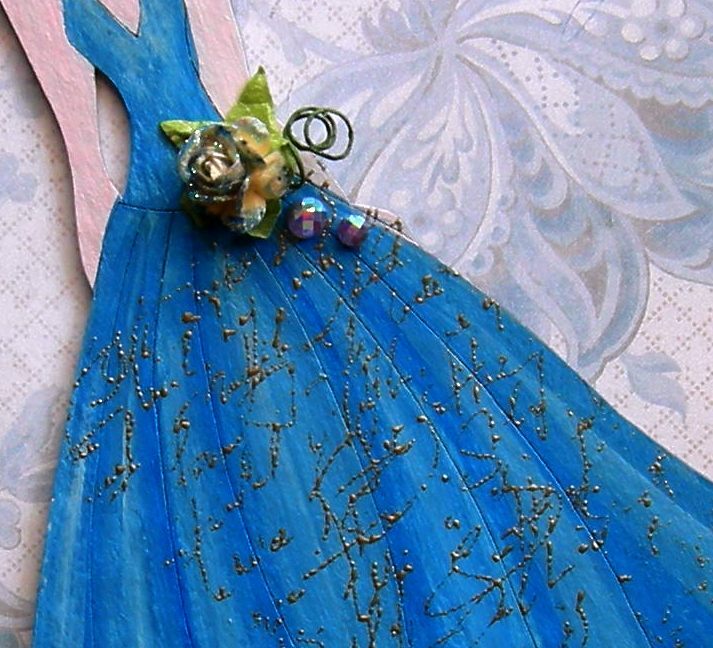 Having more fun with my chipboard couture girls! Surprisingly easy to paint, because all the details are etched in. It's kind of like painting by numbers. You can't go wrong! I again used Claudine Hellmuth paints and gesso for this project. I brushed a light coat of gesso over the entire piece. I painted her skin with a mix of Blank Canvas, Painterly Pink and Modern Red. 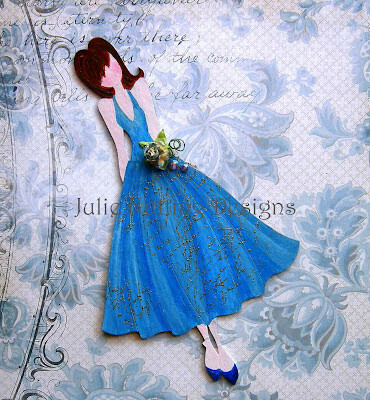 Her dress is a mix of Sky Blue and A Smidge of Blue with some Blank Canvas thrown in for highlights. I used Golden paint for hair because their colors are true and the consistency is perfect for blending texture. I first use Burnt Sienna and then blended in Raw Umber. Her shoes are A Smidge of Blue with some stickles mixed in. You can never have enough glitter! 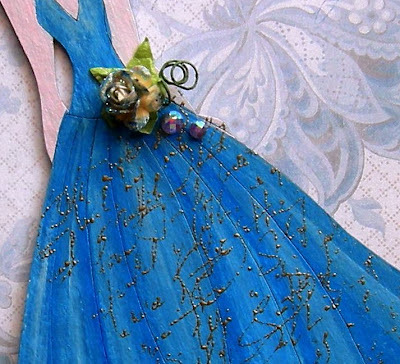 After painting,I used a new Prima stamp from their Tea Thyme collection and embossed it with gold onto the dress. There is a tiny Prima rose that I dipped in a puddle of blue stickles and a couple of rhinestones for some extra bling. She is ready to be popped on a card, scrapbook page or even a small canvas. Chipboard girls are available through Leaky Shed Studios. Love this! Thanks for sharing the creative details for those of us who are art-challenged. I bought mine today from SYHO and all I can say is INCREDIBLE!!!! I cannot wait to customize my girls!!!!! I'm so happy for you, Julie! I can't wait to see what you have for us next.